I guess we all have our little secrets and now I’ll let you in on one of mine. My mother sends me cheesecake for Shavuos each year! No, it’s not the New York-Style Cheesecake that I sell in many different sizes and flavors, it is an old-fashioned “European-style” cheesecake with a farmer-cheese filling sandwiched between 2 layers of buttery pastry. 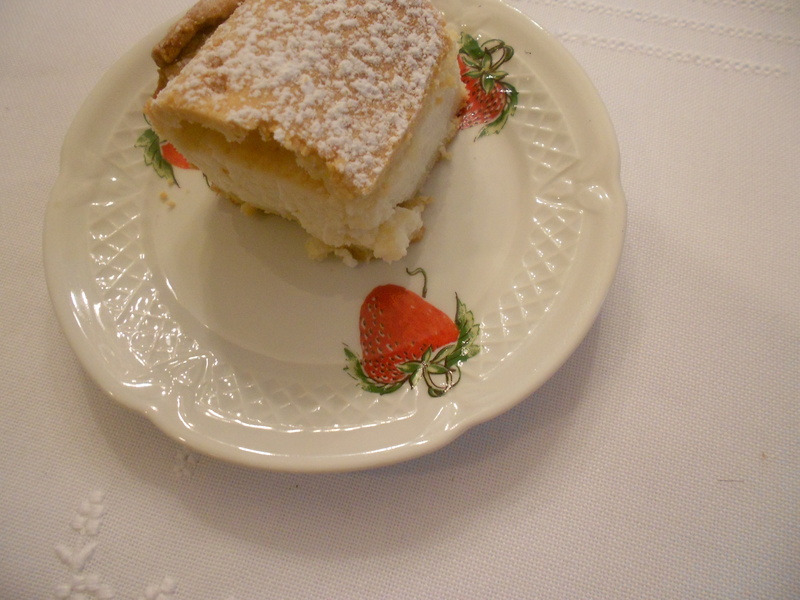 In keeping with the holiday tradition of her mother before her, my mother sends all of her children carefully wrapped packages of this delicious cheesecake along with yummy cheese kreplach, cheese blintzes, and cheese knaidlach (see previous post for recipes). At times, I buckle under pressure from customers to make these delicacies for them. But don’t think I go it alone. I will only embark on a project like this when my mother agrees to work alongside me, and by teaching me, she is continuing the legacy of a cherished family tradition. Please understand that the recipes are not exact because grandmothers tended to give over recipes by saying “a little salt, some sugar, melt butter and breadcrumbs etc.” – because they only knew when the texture or taste was right. They managed well – and so can you! For Dough: Crumble the flour and butter till butter pieces are about the size of peas. Add rest of ingredients. Do not overmix. Divide dough into 2, where one half is a bit larger than the other. Chill for 1/2 hour to 1 hour. Roll out larger half of dough large enough to cover the bottom and sides of the pan. 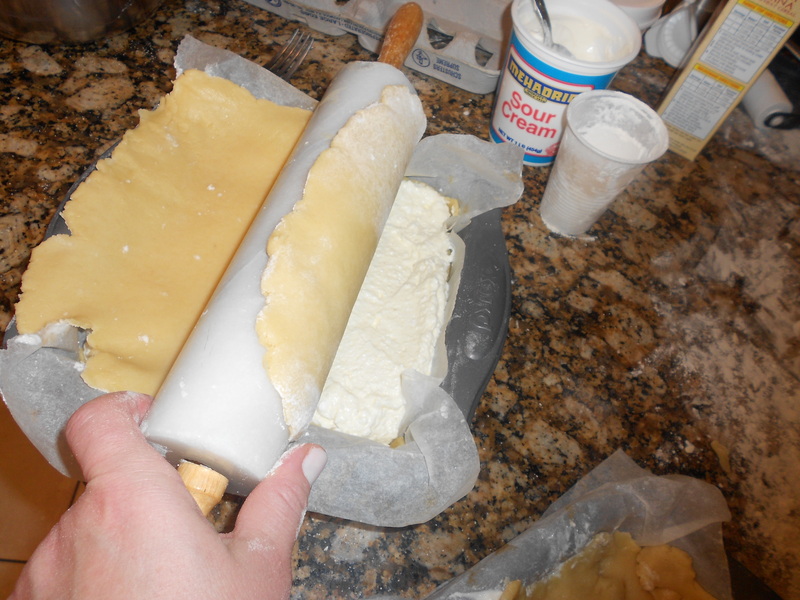 Roll the dough onto the rolling pin, and unroll into the pan. Press edges in place. Mix all filling ingredients together and pour into the dough. Roll out the second dough and transfer to top of filling by rolling the rolled out dough onto a rolling pin and unrolling it on top of the filling in the pan. 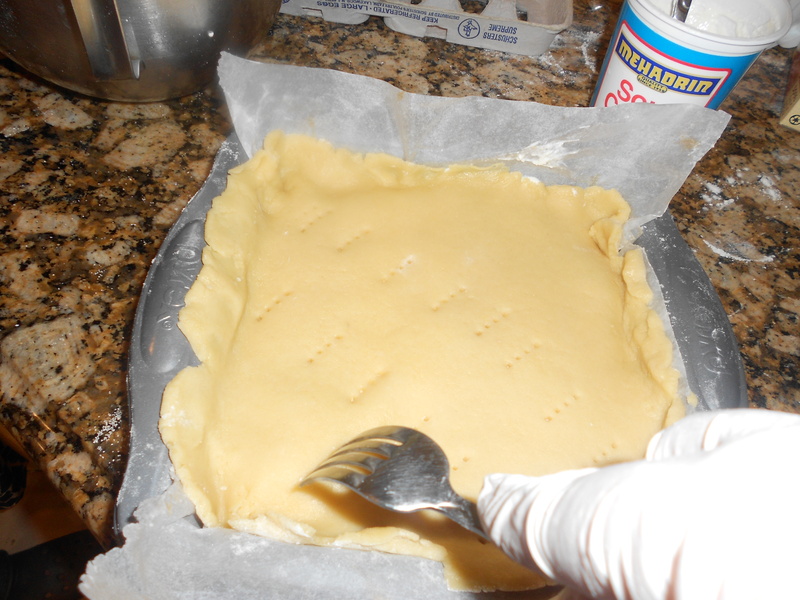 Using a fork, make holes in the top dough to allow air to escape while baking. You can freeze at this point to be baked fresh on the day of use or bake now at 350 until dough is a golden color. 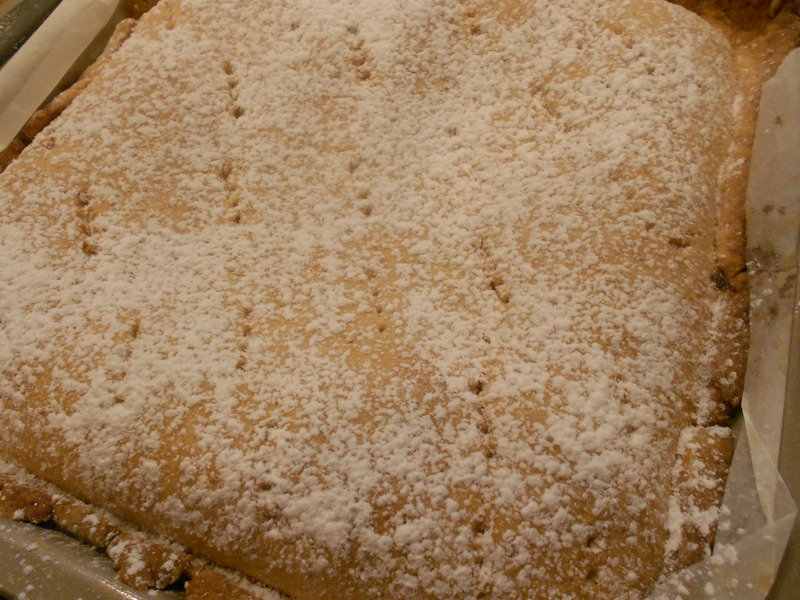 Sprinkle with confectionary sugar before serving.